Sometimes, the beautiful aesthetics and fragile glass screens of the Samsung Galaxy and Apple iPhones are not enough. Users who find themselves in the harshest of conditions need a tough, robust and durable phone which can survive the elements. That’s where rugged smartphones come in. As indicated above, rugged smartphones are designed to withstand constant exposure to environmental hazards. Therefore, these handsets are encased in a heavy-duty case (normally made out of materials such as titanium alloy, thick aluminium, plastic and rubber) making them shockproof, waterproof and dust resistant. Some rugged smartphones will also have gone the extra mile and undergone IP68 and IP69 tests in order to meet military-grade specs. These tests are a universally accepted measurement of varying degrees for shock, dust and liquid resistance. So, whether you’re working daily on a construction site or a fan of the great outdoors, you can rest assured that your handset will be extremely durable, regardless of what you’re doing (within reason, of course!). Dropped your phone from 1.8m? Not a problem! Accidentally left your phone 1.5m underwater for half an hour? Your phone will still be working. However, the best rugged smartphones also boast extra features such as infrared cameras and programmable buttons which can allow you to open specific apps. 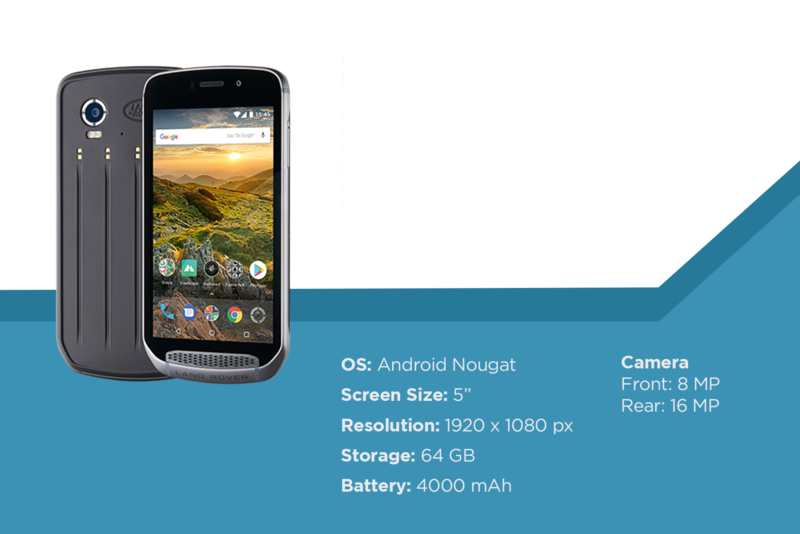 It’s safe to say this market is rapidly growing, especially as the Android Enterprise Recommended scheme has expanded to include rugged smartphones. 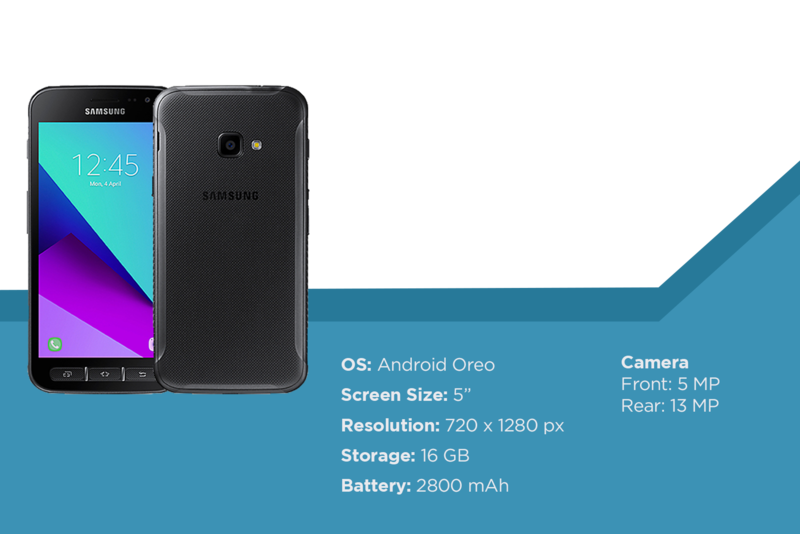 Not all phones are made equal and have been designed with a specific market in mind. Therefore, we’ve laid out the best rugged smartphones of 2019 below. 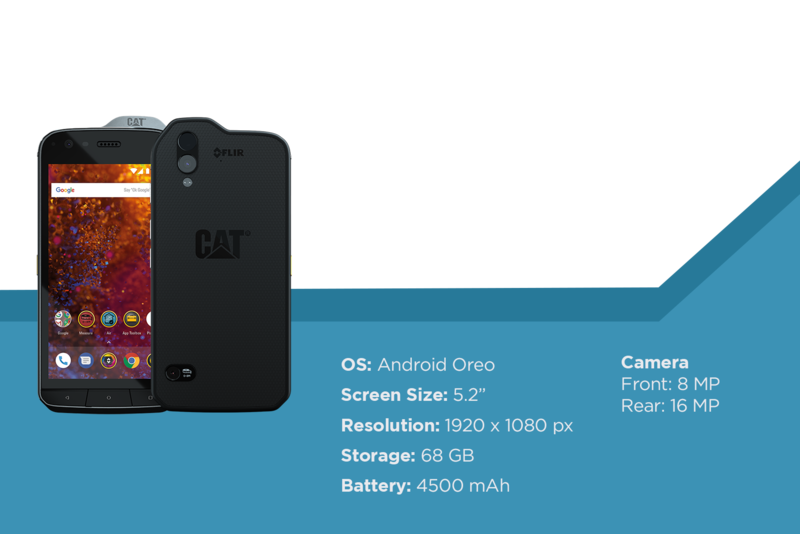 You can easily consider the CAT S61 as the flagship handset for rugged smartphones. Firstly, it’s the only phone on the market which is both IP68 and IP69K rated meaning not only can it be submerged in water for up to an hour (which is impressive alone), but it can also resist high-pressure water jets. Rest assured, you won’t be able to find another smartphone with that level of durability. Plus, it benefits from a thick aluminium and plastic encasing. Ideal for: those who work in the architecture, engineering or construction industries. In line with this heritage brand’s original product, the Land Rover Explore is the perfect companion for those who love to roam the great outdoors. The phone has mid-range specs with the camera being a particular let down; compared to phones with much lower price point, it underperforms. However, the phone is very tough with an IP68 rating and has Gorilla Glass 5 and an additional protector for its screen; this can alleviate any fears of a potential cracked screen when accidentally dropped. 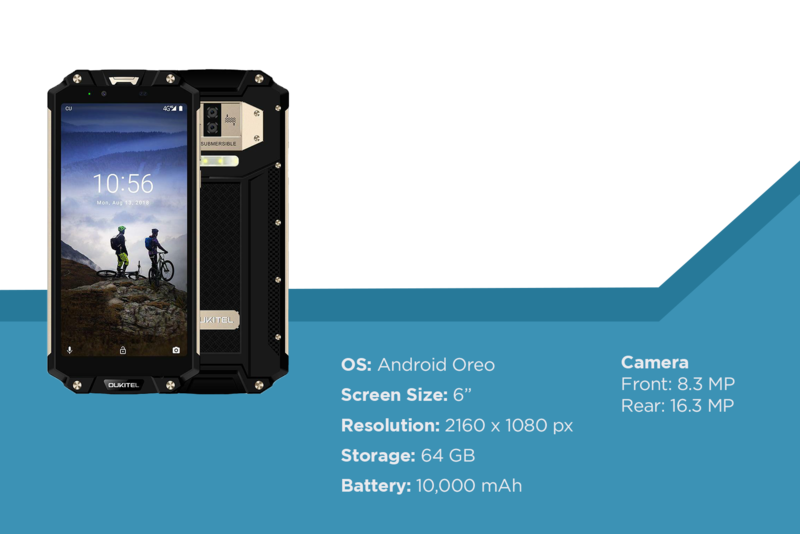 It can also survive wide-ranging temperatures from – 30 °C to 65°C and has a large 4,000 mAh battery, so no matter where you are in the wilderness, you can nearly guarantee that your phone will still work. You can also buy an additional battery pack to extend the battery size and prolong the battery life. However, the pack can make the phone extremely bulky; it will not fit in a normal trouser pocket. Nevertheless, the availability of Ordnance Survey maps and additional tools for hiking and cycling make this phone incredibly handy. Ideal for: the explorers who love the great outdoors and want tech to enhance their experience. Although a small brand, Doogee are known for developing rugged smartphones which pack a punch. In particular, the S90 is a worthy addition to the market due to its modular system which can change the smartphone’s functionality within minutes. From a professional camera, to a walkie talkie, to a gaming console, this system allows the handset to be incredibly flexible. In addition, the battery module doubles the battery life (increasing up to 10,010 mAh) enabling the user to carry on using the smartphone throughout a weekend on just a single charge. It also offers serious protection with its titanium alloy build and rubberised body but weighs in at 300g, meaning the phone is noticeably bulkier than other handsets on the market. However, with a price point from £326, this smartphone will definitely attract. Ideal for: those who want a rugged smartphone with extra features but without the hefty price tag. This phone, without a doubt, is big and tough. With its IP68 hardened case and tork-head bolts, this phone weighs in at a heavy 365g. Whilst this phone wouldn’t incur any damage to itself when dropped, we advise users to wear steel-capped boots for protection! With a mega 10,000 mAh battery, this phone can last long periods of time making it ideal for hikers or those who like to explore off the beaten track. Furthermore, the phone has the ability to charge other devices due to the USB on-the-go implementation of Type-C connector; something which could be incredibly handy when users are not located near to a power source. But don’t expect much from the phone’s performance and camera, as both are lacklustre. However, the large 6”, 2160×1080 resolution screen makes up for it and its price point of £236 makes this a phone of excellent value. Ideal for: those who explore far and wide with their phone but don’t want the bells and whistles. The Galaxy XCover 4 is Samsung’s most robust smartphone with an IP68 rating. The aesthetics of the frame are not overtly ‘rugged’ compared to other handsets listed in this article. Instead, the frame feels smooth yet sturdy with an easy grip, omitting the harsh edges and bolts most rugged handsets seem to carry. The battery is much smaller than its competitors but is still noteworthy as it can last for more than a day with medium usage. It also performs well at multi-tasking as it can surf the internet and play games with ease. Therefore, the phone appears to aim more at the average user and not those who work in particular industries or like to engage in high-risk activities. 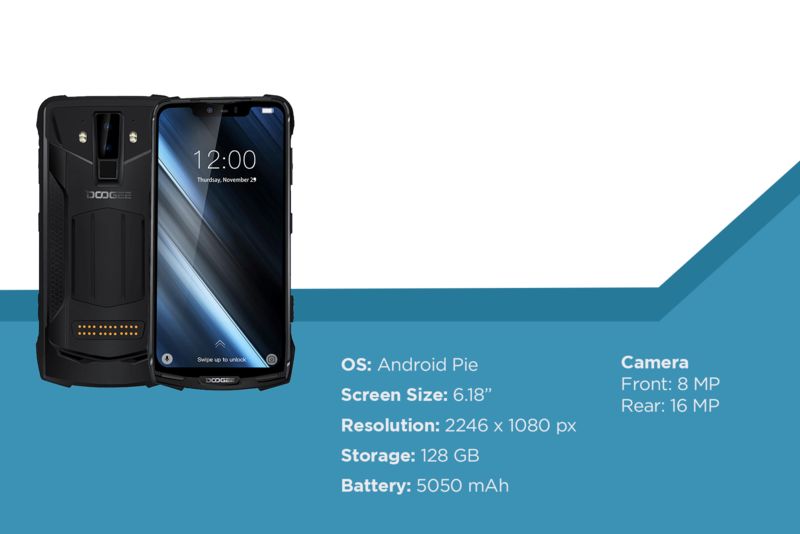 However, watch this space, as there have been rumours that a Galaxy XCover 5 is on the horizon after being prematurely shown on Samsung’s New Zealand site. Ideal for: the accident-prone every-day user who may need a tougher phone than other Galaxy and iPhone models.